Mt. 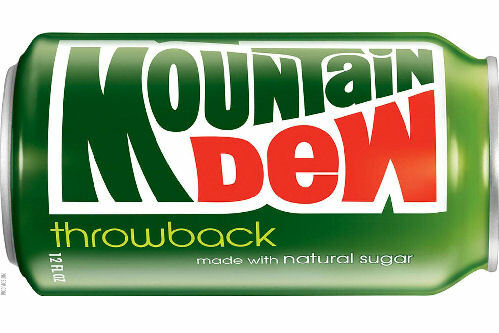 Dew Throwback is what I’m reviewing today. In case you don’t know, about 20 years ago or so, the soda manufacturers switched from using sugar as a sweetener in their products to High Fructose Corn Syrup. I don’t know why, but I’m willing to bet it was because it was cheaper. Well guess what? The Pepsi bottling company in Mexico never switched and is still using sugar today and glass bottles if you want to believe that. What they’ve found is that people travel from all over the USA to get it made with sugar the way God intended. With all this in mind, Pepsi went ahead last April and released Mt. 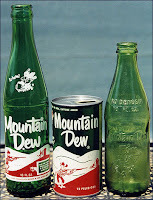 Dew Throwback and also Pepsi Throwback, which was their regular formula but sweetened with sugar. They didn’t market it very well and the packaging made it almost impossible to see that it was something new or different and it didn’t do very well. 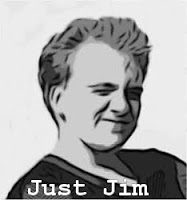 However, by popular demand (by those who had discovered it last April), it is back for another limited run. From December 29 until February 22 you can buy it. Better still they changed the packaging to what it was back in the 70’s and 80’s for both Mt. Dew and Pepsi. My two favorite sodas are Pepsi and Diet Mt. 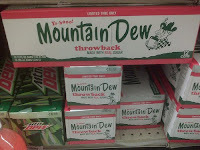 Dew so I went on the search for Pepsi Throwback but so far have only found Mt. Dew Throwback. Admittedly, I haven’t looked very hard. I don’t really like Mt. Dew, but I don’t think they’ll be making Diet Mt. 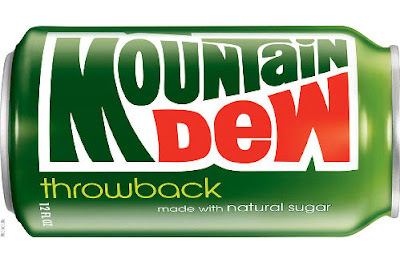 Dew Throwback (“Now with Real Saccharine”) any time soon, so I went ahead and bought a 12-pack of 12-ounce cans of Mt. Dew Throwback. I have to give one star for the packaging. I’m a sucker for retro stuff and being a teenager of the 80’s (yes I have lots and lots of Thompson Twins on my iPod and yes I had a hair-tail in 1986, but I digress), I was very excited to see the old mountain man on the cover of the box. The Pepsi Throwback is similarly retro. I have to give one star for just the balls of the whole thing. In a world where the fast food industry is being blamed for people dying of obesity-related diseases and the government trying to add an extra tax to sugared sodas and outlawing Trans-fat, God bless Pepsi for saying “Well I do believe all you whiney little cry babies can go to hell, we’re going to make this with real frick’n sugar”. The way things were heading you would have thought they would have tried to sweeten it with carrot juice or something, but no. Sugar. 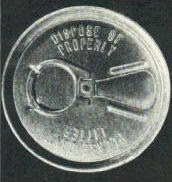 A substance that most agree if discovered today would not be approved by the FDA, is making a comeback. They miss out on a star because I would have liked to see it in a glass bottle. I mean why not? Well, ok, fine, don’t put it in a bottle because cans are fine, but why not the old fashioned pull-off tabs on top of the can. Remember those? That would have been awesome, but they didn’t do either so no star there. They miss out on a star because it’s for a limited time only. Why? Put it out there and if it sells it sells and if it doesn’t it doesn’t. Warning us that this is for a limited time only makes me use my entire house payment so I can stock up on it. That is if it’s any good. This leads to the last possible star. Is it any good? I got the 12-pack home and put it in the fridge, placing two cans into the freezer. 20 minutes later I cracked open a now very chilled can of Mt. Dew Throwback and took a swig. I didn’t like it. Well, I mean it didn’t seem like that big of a deal. I finished the can and within a few minutes had really bad heartburn. I drank a second can just to see, but didn’t like it either. Today I cracked opened a third can and guess what? It was so frick’n good. It was so good that I remembered the Garlic Sauce pizza I had the night before which was probably the real source of the heartburn. I guess I just wasn’t in the mood last night for it, but wow. It was good. It had no aftertaste. It went down smooth. It was hands down the best soda I’ve ever had. So for that they get a star. What is that one, two, three. OK. I give Mt. Dew Throwback three stars. I highly recommend you go out and try it since it’s going away. I hope maybe a throwback generation 3 comes out where it’s in 16-ounce glass bottles, pull-tab cans and not for a limited time. That would be cool. I’m going to try the Pepsi Throwback just as soon as I can find some and I’ll let you know how that stacks up. I guess Coke could do the ultimate Retro Coke and sweeten it with Cocaine again. That would really be stick’n it to the man. I'm willing to bet you could find some Pepsi Throwback at a Super Wal-Mart, up in the fridges by the registers. It's not that good though. But I'm definitely a Coke guy.